At Peña’s Disposal, we pick up with a purpose – a cleaner tomorrow! That means doing everything we can to make sure we only send trash that cannot be recycled to the landfill. Our 62,000 square-foot Material Recovery Facility, which is staffed by dedicated employees, plays a big part in that mission. Waste-hauling trucks enter the facility – a clean, safe tipping area – where containers are weighed and logged into our database. The general public can also use the facility as a place to haul their waste. 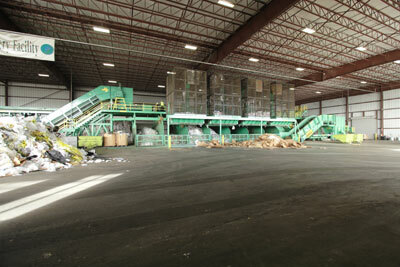 Everything brought into our Material Recovery Facility is visually inspected for recyclable material. Peña’s skilled personnel sorts through the material by commodity. Once all the recyclable material has been identified and sorted, it is the baled and prepared for shipment. The non-recyclable material, or waste, that remains is then transported to the landfill. We offer tours of our Material Recovery Facility and a meeting room where groups interested can learn more about the recycling process. To schedule a tour – download our request form.